Use the Export>Image function to create image files of your work. This function allows you to create images in .BMP, .DIB, .GIF, .JPG, or .TIF file format. Using a rubber band box, you can select which area of the model you want to save as a graphic. NOTE: The area to be saved must be contained within one viewport. 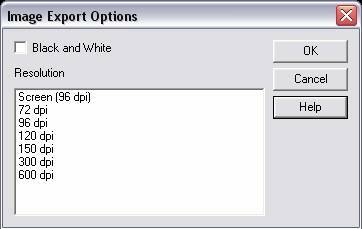 After you have selected the area to save, A File ”r;Save As” dialog will appear. This dialog has an Options button in the lower right corner. Click this to set options related to the output of the image file. Select an image resolution from those available in the list. 72 DPI (Dots Per Inch) is adequate for screen display, while the higher resolutions are more useful for printing. Select Images from the File>Export submenu. The Save As dialog box appears, through which you are able to specify a file name and directory loScation to which the new file will be exported. Once you have specified a file name, directory location, and file type, click SAVE. Select the first corner of the area to save. You can then drag a rubber band box around the portion of the model that you intend to export. The geometry you select is exported to the .BMP, .DIB, .GIF, .JPG, or .TIF format, using the file name and directory location you specify.